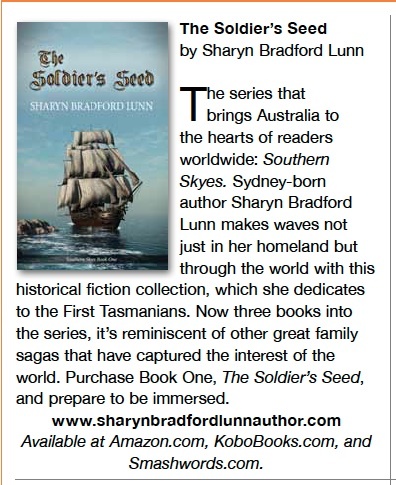 I was born in Sydney, Australia, and love reading historical fiction, which is what I write. Painting, music and genealogy are my other passions and I’m definitely a hippie and greenie at heart, but my friends sometimes describe me as a techno nerd as well just a plain old nerd – especially since I got my beloved iPad. The stories contained in the Southern Skyes series have rolled around in my head for more than a decade and were prompted by my love of history, visits to the beautiful Tasmania and my person journey into family history. While writing I’ve been able to let my imagination go wild and have, for the most part, enjoyed the process…especially the research. At other times it felt like such a long haul I wanted to give up, and I did – several times, but each time I found I couldn’t let go of what I’d started to create…something I’m sure other writers have faced as well. So, believing in the saying, ‘you never fail until you stop’, I persevered. Anyway, here’s hoping my readers find the results of my efforts worthwhile, entertaining and enjoyable. Author of the "Southern Skyes" series. Book 1 "The Soldier's Seed" Book 2 "The Divergence" Book 3 "Jagged Waters" Book 4 "Embers of the Soul" Book 5 "Southern Cross Rising"
Guardian of Farm Pals Everywhere!